For dogs and other animal companions, toys are not a luxury, but a necessity. Toys help fight boredom in dogs left alone, and toys can even help prevent some problem behaviors from developing. Although cats can be pretty picky when it comes to enjoying particular toys—ignoring a $10 catnip mouse and marveling over a piece of crumpled newsprint—dogs are often more than willing to “play” with any object they can get their paws on. That means you’ll need to be particularly careful when monitoring your dog’s playtime to prevent any “unscheduled” activities. The things that are usually most attractive to dogs are often the very things that are the most dangerous. Dog-proof your home by removing string, ribbon, rubber bands, children’s toys, pantyhose, and anything else that could be ingested. Avoid or alter any toys that aren’t “dog-proof” by removing ribbons, strings, eyes, or other parts that could be chewed and/or ingested. Discard toys that start to break into pieces or have pieces torn off. Ask your veterinarian about which rawhide toys are safe and which aren’t. Unless your veterinarian says otherwise, “chewies” like hooves, pig’s ears, and rawhides should only be played with under your supervision. Very hard rubber toys are safer and last longer. Take note of any toy that contains a “squeaker” buried in its center. Your dog may feel that he must find and destroy the source of the squeaking, and he could ingest it—in which case squeaking objects should also be used under your supervision. Check labels for child safety. Look for stuffed toys that are labeled as safe for children under three years of age and that don’t contain any dangerous fillings. Problem fillings include things like nutshells and polystyrene beads, but even “safe” stuffings aren’t truly digestible. Remember that soft toys are not indestructible, but some are sturdier than others. Soft toys should be machine washable. “Rope” toys are usually available in a “bone” shape with knotted ends. Kong-type toys, especially when filled with broken-up treats—or, even better, a mixture of broken-up treats and peanut butter—can keep a puppy or dog busy for hours. Only by chewing diligently can your dog get to the treats, and then only in small bits. Double-check with your veterinarian about whether or not you should give peanut butter to your dog. Be sure to choose a Kong-type toy of appropriate size for your dog. “Busy-box” toys are large rubber cubes with hiding places for treats. Only by moving the cube around with his nose, mouth, and paws can your dog get to the goodies. Soft stuffed toys are good for several purposes, but aren’t appropriate for all dogs. For some dogs, the stuffed toy should be small enough to carry around. For dogs who want to shake or “kill” the toy, the toy should be the size that “prey” would be for that size dog (mouse-size, rabbit-size, or duck-size). Dirty laundry, such as an old t-shirt, pillowcase, towel, or blanket, can be very comforting to a dog, especially if the item smells like you! Be forewarned that the item could be destroyed by industrious fluffing, carrying, and nosing. Rotate your dog’s toys weekly by making only a few toys available at a time. Keep a variety of types easily accessible. If your dog has a favorite, like a soft “baby,” you may want to leave it out all the time. “Hide and Seek” is a fun game for dogs to play. “Found” toys are often much more attractive than a toy which is obviously introduced. Making an interactive game out of finding toys or treats is a good “rainy-day” activity for your dog, using up energy without the need for a lot of space. Many of your dog’s toys should be interactive. 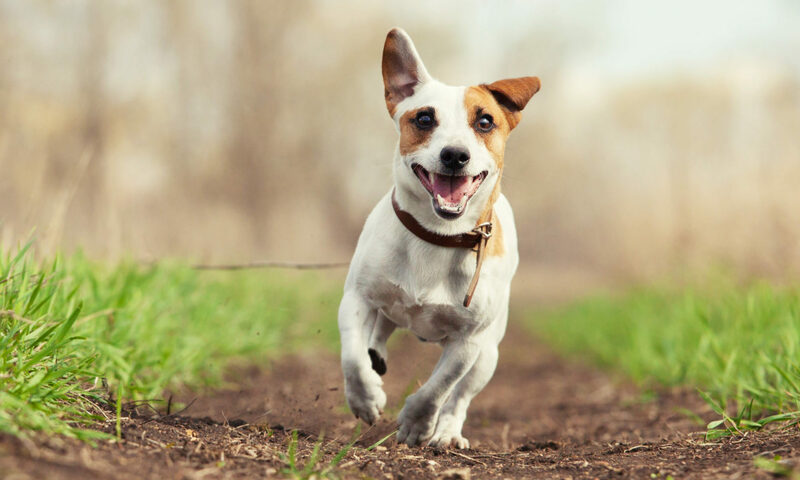 Interactive play is very important for your dog because he needs active “people time”—and such play also enhances the bond between you and your pet. By focusing on a specific task—such as repeatedly returning a ball, Kong, or Frisbee®, or playing “hide-and-seek” with treats or toys—your dog can expel pent-up mental and physical energy in a limited amount of time and space. This greatly reduces stress due to confinement, isolation, and boredom. For young, high-energy, and untrained dogs, interactive play also offers an opportunity for socialization and helps them learn about appropriate and inappropriate behavior, such as jumping up or being mouthy. © 2002. Adapted from material originally developed by applied animal behaviorists at the Dumb Friends League, Denver, Colorado. All rights reserved.